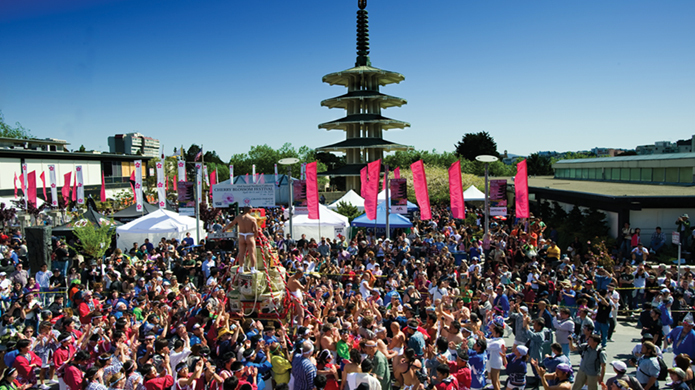 The parade begins at the Civic Center at 1:00 p.m., proceeding up Polk to Post Streets and ending in Japantown at Post and Fillmore Streets. Japanese classical (Buyo) and folk (Minyo) dance groups will perform throughout the parade route like a myriad of floating butterflies. Highly honored Boy Scout Troops from the Japanese American communities will march proudly along the streets. Streams of colorful floats will be carrying individuals of Japanese American and other Asian American communities. World-renowned San Francisco Taiko Dojo will keep the parade upbeat with the thundering sound of the taiko, and this year’s Queen and her Court will cascade their way to Japantown. Anchoring the parade is the hoisting of the Taru Mikoshi by over one hundred strong individuals. It is a spectacle not to be missed.